Click on a clip in the menu on the right. Click on a question to watch a video interview. For more videos about your body click on a clip in the menu on the right. Click on "Quizzes". To print out word searches, click on "Word finds". You might like to try this activity yourself. Scroll down and click on the links under Activity Sheets. This activity uses Flash which may not work on all browsers. Fabulous flap book that reveals the inner workings of the human body. Bright, original colour illustrations and diagrams display all the major organs of the human body and are accompanied by witty, clear and informative text. Contains over fifty embedded flaps that children can lift to reveal extra detail. 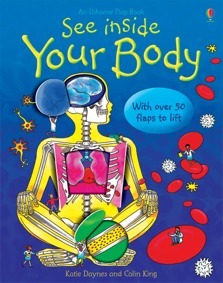 This is a great book for introducing children to the inner workings of the human body. It is especially good for children with why and how questions about what happens in their bodies. The lift flaps are excellent at keeping the books and content interactive and entertaining. Two that my daughter (nearly five) adores and goes back to again and again are See Inside Your Body by Katie Daynes (£8.99) and The Flip-Flap Body Book (£7.99, both Usborne). The first is fairly detailed, and it covers eating, excreting, bones, muscles and the senses and has lift-up flaps. It’s really good for learning about food and what happens to it. You can read out the simpler bits and go into more details as she gets older. If you were to buy just one book for her that would be right for her now and last for a couple more years, this would be my recommendation. The Flip-Flap Body Book covers food and digestion, the sense and how babies are made in a very basic fashion (note: each of these topics is the subject of a separate book that goes into more detail and costs £4.99) but it’s very accessible and aimed at young children. A smart, fun, exciting, interactive introduction to what is arguably the most fascinating topic of scientific study, the human body. The flap panels encourage the reader to participate in the journey into the hidden wonders that our body has to offer, taking them deeper into the functionality and intricate detail of our tissues. With a perfect balance of scientific terminology and simplistic explanations of the various systems in our bodies, the young anatomist will find this book informative and stimulating. It’s a superb introduction to the human body! I am a mother of 5 and I work in the medical field. This book keeps all of my kids entertained. This is a book we can all read and learn together. My two and four year old love lifting the flaps as I read to my nine and eleven year old. They have found this book to be entertaining and educational. We have a ton of books. This one is just amazing. It's been my kid's favourite book for well over a year, since the day she got it. When her friends come over they are always reading it. Explains the body better than I can and she has retained so much knowledge. The most fun she'll ever have learning! My 3 year old daughter is completely enthralled by this book. She loves finding out what different organs do and what they are called. I am a lab tech, and have taken the opportunity to start teaching her the medical terms for different structures as well as some of the bones. I think she now knows more about the body than many people 10 years her senior. The flaps and artwork and little characters capture her attention, sometimes for hours. The production of waste, the cut, the germs in the blood and the lung, and the skeleton are particularly interesting, but her favorite by far is the broken tibia. My daughter loves this book and so do I. I highly recommend it! I bought this book for my little girl who was asking a lot of questions about the body that I didn't know how to explain to her in a way she would understand. This book is fantastic!! I can't say a bad word about it. It's a great way to have fun with your child whilst they learn. Even my 2 yr old son sits down with us whilst we read and he's picked up quite a lot of info. I would highly reccomend this book to any parent and even school children to read themselves. For 9.99 you can't complain, money well spent I say. This book is excellent for all ages, gives a really good insight to a human body and the colourful way the book shows this is good. Absolutely fantastic. My daughter, Hollie age 3, thinks this book is fascinating, really interested in every page, especially lift-up flaps. I recently purchased this book for my 4 yr old. She had been asking a lot of questions that I could not answer, so I purchased the book after looking through it a bit. It has wonderful illustrations that are easy to understand, and the interactive flaps are fun to lift up. I find it so much easier now to describe things to her, with help from this book! Thank you! this is a super book for the inquisitive child. there is enough easy english to encourage new readers to have a go themselves, and enough of the harder words to keep the older ones (and adults) interested. the colours are great and the flaps prove irresistible to small fingers. the topics covered are sensible and appealing to the young audience e.g. eating & excreting, and the section on breathing (pictures of healthy & unhealthy lungs) get the no smoking message across without even seeming to try. the book has proved well worth the price in our household. we have had it over a year now, it is extremely well thumbed but the flaps are holding up very well. thank you.